You could describe The Jolly Botanist as my local, as it is a mere 200 metres from where I live and a stones throw from Haymarket train station and tram stop. 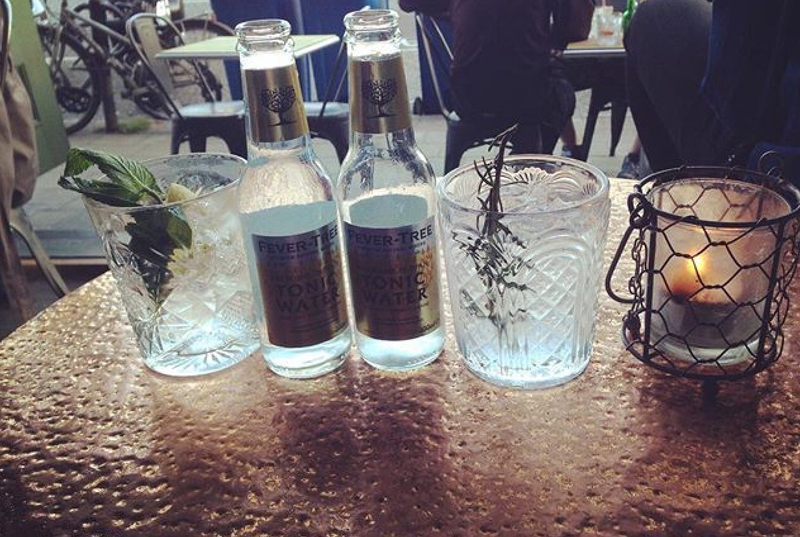 With a classy but quirky Victorian-aged style, it is the perfect place for a gin and tonic with it being a gin bar stocking over 72 gins, so plenty to sample! However it stocks all of your other spirits you would expect from any other bar, as well as lagers, craft beers, wine, cocktails and prosecco. Great for a few weekend drinks or a couple of gin and tonics midweek, it also boasts a bit of space out front which is great on a sunny day for catching some rays compete with gin in hand. I’ve been in a few times, can you believe however that I had never eaten there! I’d been dying to try their food and as it is normally quite a popular place that can be quite busy at times, I was chuffed when on the 23rd of December we were invited out there for lunch with friends. It was the quietist I’d ever seen it, being 12:30pm on a weekday afternoon, when a lot of people were still working their last day before the Christmas break (not us teachers though). We found a nice cosy alcove bit of the venue, with a cool wooden bench with cloth material as a backing and a ‘Have a Jolly good day’ cushion for comfort. I always thought the back part of the pub was for eating only but they said we could sit where we liked. The place soon became busy with groups of people celebrating the Christmas period. The staff were really attentive and when it came to ordering I knew I fancied something meaty. 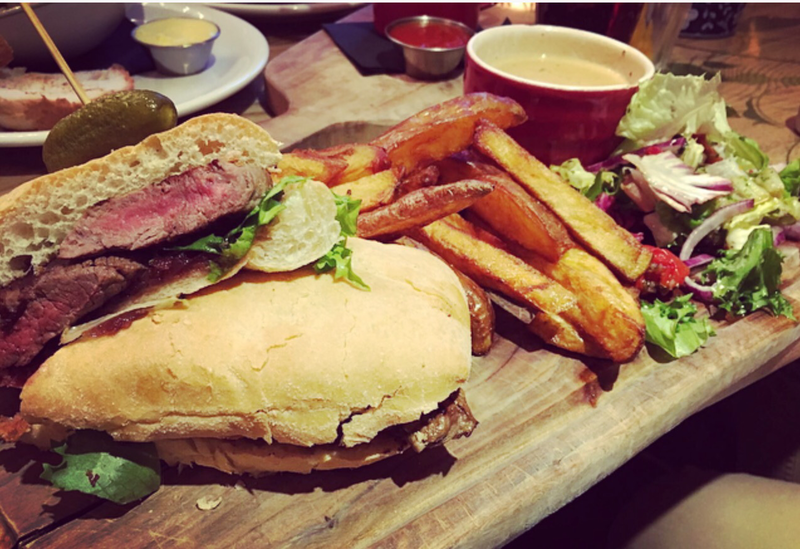 Fillet steak sandwiches and the Botanist burger were in popular demand. For those of you who have read my Fork & Field post, The Jolly Botanist and Fork & Field are owned by the same company. 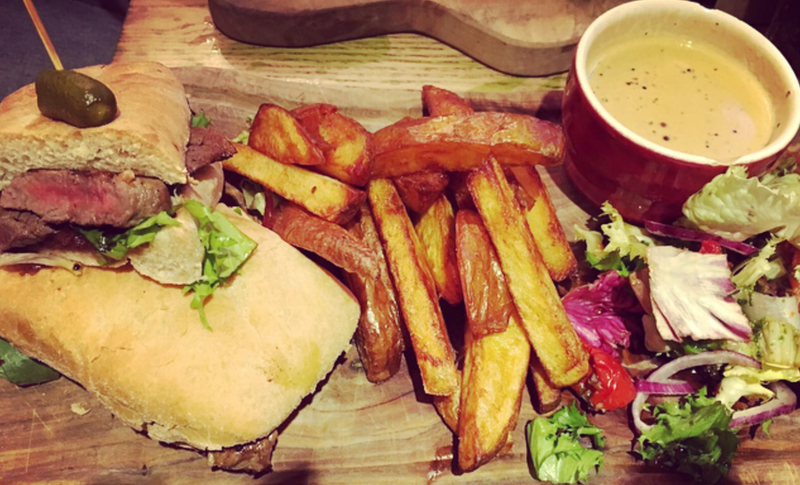 My fillet steak sandwich came complete with red onion chutney, hand cut chips and a big dipping bowl of peppercorn sauce. I’m licking my lips thinking about it now, in fact I had the steak sandwich at Fork & Field when I went too and both were extremely soft, succulent steaks with not an ounce of fat to speak of. The peppercorn sauce was so moreish and you can’t beat hand cut chips, they were soft in the inside and crispy on the outside, just as chips should be! 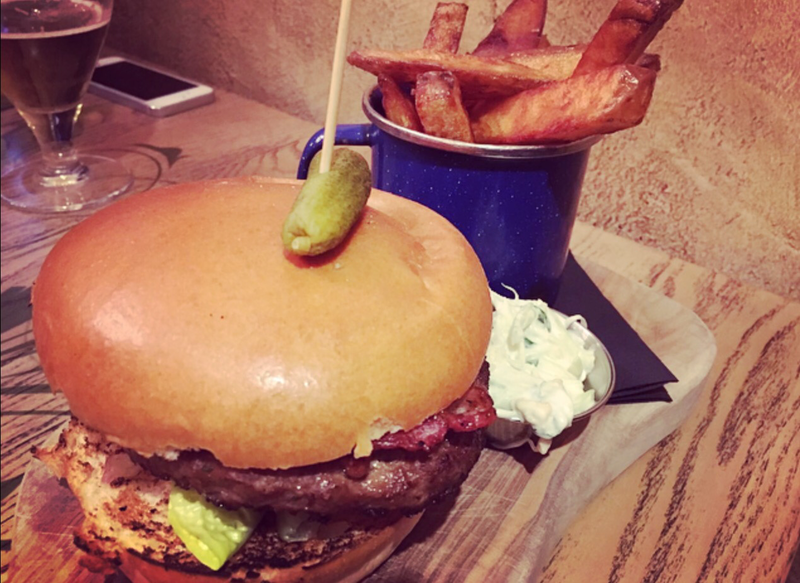 The burger is described as hand pressed with Virginia bacon & Orkney cheddar, horseradish slaw also served with hand cut chips, both the burgers got top marks for taste and portion size. There’s an array of choice on the menu from soup of the day served with bread and butter to haggis scotch eggs and beef Wellington, posh pub grub at its best! I think it’s fair to say that I will be frequenting The Jolly Botanist much more in future now I’ve had a taste of what’s on offer. This entry was posted in Alcohol, Burgers, Dinner, Gin, Lunch, pub grub, Scottish, Steak, Uncategorized and tagged Burger, Gin, Steak sandwich, Weekend, Weeknight, West end. Bookmark the permalink.